To lift off just like that and being able to fly has always been one of the greatest desires of mankind. For centuries, creative minds have been inventing and developing different aircrafts in order to achieve the ultimate freedom. Have you ever looked to the sky above, admiring and envying the birds at the same time? Stop dreaming! Have a look at natures most beautiful side by joining us on a paragliding flight. 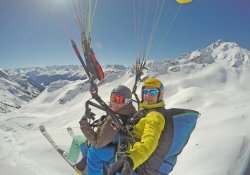 For 20 years now, the team of tandemkurt, led by the owner Kurt Burger, is offering the opportunity to fulfill your dreams, by taking you into the sky by means of paragliding. Flying is our passion and doing this for a very long time has resulted in a team of experts with a lot of experience. As an officially approved tandem enterprise we are proud to say that we were amongst the first ones to offer this kind of experience. Our office is located at the valley station of the Versettla lift in Gaschurn. Book your first class excursion now and experience the fantastic mountain scenery from a different perspective in Montafon | Vorarlberg. Flying with a paraglider is an adventure that is unparalleled. Bungy- and parachute jumps may of course be thrilling to adrenaline junkies, however these activities will not be able to give you the breathtaking feeling of hovering the air as you will experience when paragliding. Once you have lost ground contact, you will find yourself wishing to stay up in the air forever. Paragliding is the ultimate flying experience! We guarantee a minimum airtime of 15min and depending on the weather even a lot longer. Your Safety is our highest priority! Our professional tandem pilots meet all legal requirements for commercial tandem flights and are trained and controlled by aviation and aeronautical departments. In addition, our pilots have to complete an annual "Safety in Flight" training program where emergency situations are practiced. They are supported by the "Rogallo Rescue System", resulting in an increased safety and quality standard. We have made it our mission to offer you as many different flight routes as possible. You can choose between various flight locations in the Montafon valley such as Schruns, Tschagguns, St. Gallenkirch, Gaschurn and many more. When paragliding we will be able to gain an altitude of up to 1600m. Our multi-member team will not leave you out of sight and accompany you every step of the way. Nothing is left to chance with tandemkurt: Be it our exclusive clothing style or the specially designed paragliders, everything is rigorously planned. This also goes for the flight procedure, starting from the arrival at the meeting point, approaching the launch area, briefing and preparing the passenger until the actual flight using only top of the notch equipment. So if you are between eight and a hundred years old, weigh between 35kg and 125kg and highly motivated we sincerely invite you to fly with us! Of course you can also get a paragliding tandem flight as a gift voucher for partners, family and friends. 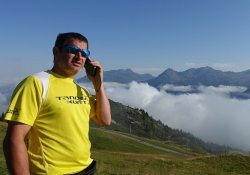 Be it in the cold winter season - it is just a thrill to ski down the slope and eventually lift off - or in the hot summer time, we are always at your disposal and happy to answer any questions concerning your next adventure. Please visit us on Facebook or contact us by phone at +43 660 35 93 672. 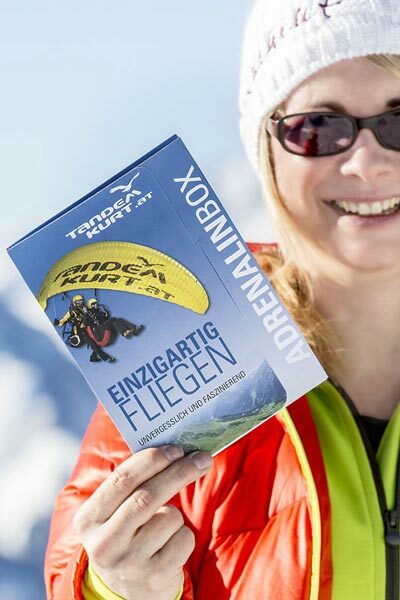 Register for a tandem paragling flight in Vorarlberg | Montafon now! The team of tandemkurt consists of professional pilots with a lot of experience gained throughout numerous flights. 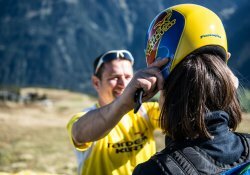 Enjoy the tandem flight with the certainty of having a safe pilot at your side. In winter we launch by ski, but also on foot. The entire flight equipment will be provided by us. Booking and departure date will be coordinated by telephone. Looking for a memorable gift? Then you are at the right place! Tandemkurt guarantees unique thrills and breathtaking views - in short, an extraordinary adventure you will never forget. 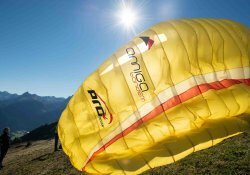 Those who have completed a tandem flight with us in Vorarlberg thus picking up paragliding for themselves, enjoy coming back! If you want your partner or friend to accompany you when paragliding, a voucher for a tandem flight is an excellent choice. 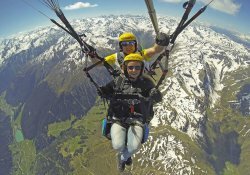 We are looking forward to take you into the sky in a tandem paraglider in Montafon! Visit our and share a tandem flight!